Physical & Economic Water Scarcity? Starter - Watch the following YouTube video and define both physical and economic water scarcity giving examples of areas of the world where a problem exists. You may want to use the recording sheet produced by GeoBlogs, also embedded underneath. Objective: Examine the competing demands for water in a specific river basin. Evaluate the strategies that have been adopted to meet these demands. The worksheet booklet for this case study is below. Click on the blue tab. Task 1 - Where are the conflict zones? Using this web link, create a list of global conflict areas in your exercise book. Click on the link for 'overview' and print out the article and highlight the key problems in the provision of freshwater to an increasing population. Task 2 - Introducing Israel and the Gaza Strip. i. Use this web link to read up and update your knowledge on the Geography of Israel and the Gaza Strip. Also, watch the YouTube videos underneath and read this BBC article. Create a fact sheet about the area using the introductory paragraphs and the headings in blue (on the first web link) as a guide. Include key historical events and population and development facts and figures. Your major point of note should be the position of the country and the border control around it. ii. Using the Google map, create a sketch map to show the location of Israel and the Gaza and explain the situation that the population of the Gaza Strip find themselves in. Task 3. Using this web link, make comprehensive notes on the issues surrounding the competing demands for water in Israel and the Gaza Strip. Try to make as many links as possible between the physical scarcity of water in this arid area, the physical position of Gaza (positioned betwe0en the sea and Israel) and the restrictions in place at the borders of the Gaza Strip. New in 2012 - Read this Guardian article that summarises a new initiative to provide water supplies to residents of the Gaza Strip. Free Flickr images to use in the your essay for illustrative purposes. Water in the Middle East is both a contentious issue and valuable resource which is facing severe depletion. It is an underlying source of tension in an already hostile conflict between the residents and leaders of the neighboring territories of the Gaza Strip and Israel. This essay will examine the causes and effects of this water related conflict and to discover to what extent the situation is being managed and how effective these intervention strategies are. 3. Evaluation of management strategies implemented and adopted by the respective governments. Over to you ........ it may look something like this essay - an example of good practice. Objective: Examine the competing demands for water in a specific river basin covering two or more countries. Evaluate the strategies that have been adopted to meet these demands. Research: Watch Blue Gold (YouTube). Take notes and look out for any information on USA/Mexico or on the River Nile. 1.5 hrs. Using the information below, choose an area of the world where a water conflict exists between two or more countries (international) Research the history of the conflict carefully, the current situation and likely outcomes of the conflict. Task 1 - Split into pairs. i. One person should focus on the conflict that exists in the Nile region and the other between the USA & Mexico. iii. You partner should fill in one of the crib sheets below as you teach them to record your facts and figures. You SHOULD NOT dictate, word for word the content. iv. SWAP ....... and do the same as above. v. You then have 15 minutes (timed) to write up an essay based primarily on your own study but must contain elements of your partners study to satisfy the "one or more" part of the question. 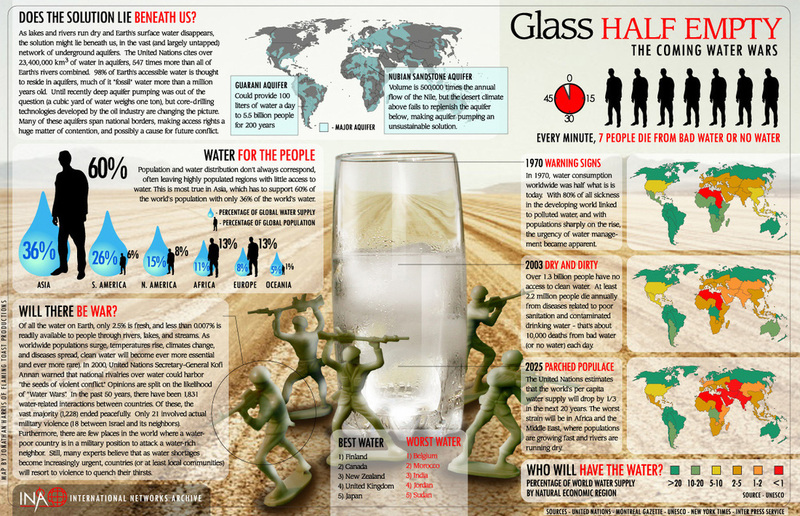 Your starting point is to research this website that gives you a general overview of the global water conflict situation. You should make notes on the key points as this will act as good material for your introduction to the exam question. Alternative Case Study - Click here for the situation in the Mekong Basin, Asia. Report on the ongoing water conflict between these two countries. Read GeoFile 501 - September 2005 & GeoFactsheet 254 - Water in the American South West. Summary document of Nile conflicts - Well worth a read! Population Growth: The World's population currently stand at about 7 billion. Demographers argue about when and how high the World population will peak at, but most agree that it will be at least 9 billion. Obviously as the World's population increases, so does the demand for water, for drinking, washing, cooking, etc. Economic Development: Generally, the more developed a country, the more water that it uses. Looking at the graph below, it is obvious that the biggest consumers per capita are all MEDCs. As the World's population increases, so will the demand for water. As people are richer they have flush toilets, showers and buy washing machines, dishwashers, etc. Increased Agriculture: As the World's population grows an gets richer, the demand for agricultural products will increase. As the demand increases so will the need to irrigate more arid areas. Also a populations develop, they tend to eat more meat, which needs even more water. It is estimated that it takes 10,000 litres of water to produce one beef steak. Industrial Growth: Again as the World's population grows and becomes richer, the demand for industrial products grows. More people want cars and televisions, computers and cookers. Any industrial product or industrial process uses water, so as demand for the products goes up, so does the demand for water. Global Warming: Global warming is affecting different regions, in different ways. Although some areas will become wetter and possibly colder, areas that already are arid and suffer drought are likely to become more arid and suffer more drought. There will be less precipitation, but there will also be more evaporation. The areas that are likely to get drier include the Sahel and the Middle East. So not only is demand going up, but supply will be going down. Water Pollution: The supply of water is also being reduced by pollution. This might include natural groundwater pollution like in Bangladesh or more accidental (or deliberate) pollution like in Hinckley (Irrigation and agriculture). Acid rain and an increase in salinisation will also make more water unsuitable for human consumption. Groundwater Depletion: Supply is also being reduced because groundwater is not only being polluted, but removed unsustainably. Over abstraction can cause subsidence and saltwater intrusion, but also conflict over reducing supplies e.g. Israel and the West Bank. Shared Resources: Many countries share rivers and lakes. 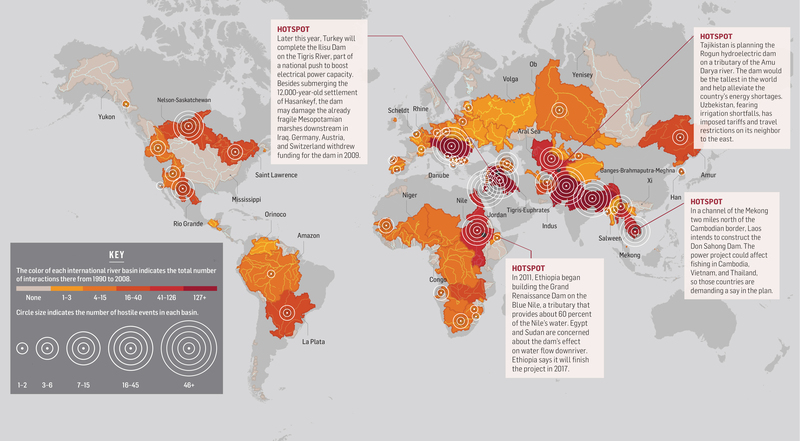 As the demand for water increases and the supply decreases, countries are going to come increasingly into conflict about who the resources belong to. One of the best examples of this growing conflict is the River Nile.